Boiler Repair Service * No trip charge for any repair over $150! Call for heating experts today. Boiler service and repair is one of our specialties! 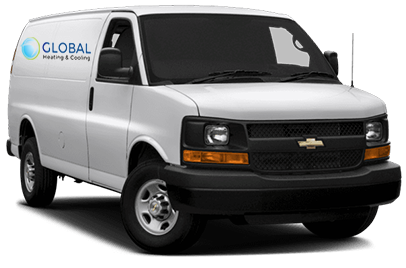 Global Heating & Cooling offers a free trip charge for any service totaling over $150 for our valued customers. We service and repair all kinds of boilers: steam boilers, hot water boilers, central heating boilers, electric boilers, wall hung boilers, and electric ignition boilers. It is estimated that after ten years, boilers are only operating at 60% capacity. Let us help you ensure that your boiler is operating as well as possible, so that you are making the most of your electric usage. If you find that your boiler is beyond repair, we also offer brand new Energy Star Rated boilers and installation services. A new energy efficient boiler can save you up to $300 dollars per year in operating costs, and they are quieter, more compact, and more efficient than older models. Lack of Hot Water – If you suddenly lose hot water, it could indicate a broken airlock or diaphragm, valve failure, thermostat issues, or improper water levels. Boiler Leaking and Dripping Water – Global Heating & Cooling will assess the situation, determine where the leak is originating from, and stop the leak! Odd Noises – If your previously quiet boiler starts to make noises such as banging, gurgling, or whistling, it often means that there is air inside the system or that the pressure is off. It could also indicate a problem with the pump. Pilot Light – If the pilot light on your boiler goes out, we can fix that for you! No matter what the reason for the light going out, we can fix the source problem, and install a new light. Water Pressure Loss – No one enjoys a shower with minimal water pressure. If this happens, usually a leak or valve problem is to blame. Contact Global Heating & Cooling today at (773) 801-3734, and our team of experienced heating and cooling professionals will help you decide on the best course of action!